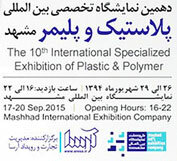 This exhibition will surely benefit the visitors who want to establish or expand the plastic and polymer business from/to Iran . Our Company, PlasticKar will show PVC and PE products such as PE Films, PE Bags, PVC Granules, PVC Hoses and many more in Ferdosi Hall. We are eagerly awaiting to see your presence in the exhibition.